This Olfa Rotary Cutter is the standard design with a round razor blade at the end of a straight, bright yellow handle. 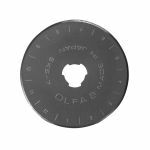 The Olfa 45mm rotary cutter measures 6 3/4" long x 1 7/8" wide. The handle measures 1 1/8" wide x 3/8" deep. At the end of the handle, opposite from the razor blade, is a hole so that one can hang the cutter if desired (or thread it on a chain or tie a piece of fabric or ribbon through the hole for identification. The round razor blade is made from tungsten carbide tool steel. Olfa states that their blades are the longest lasting blades in the business. The round blade is wide at 1 3/4". The blade is attached to the end of the cutter with a screw, and a black plastic collar surrounds the edges of the blade when the rotary cutter is not being used. This safety device is operated by a simple push/pull lever that pushes the collar around the blade to cover its edges when not in use, and pulls backward to reveal the sharp blade for cutting. The handle, though rectangular, has a rounded end so that it fits easily against the palm of the hand during cutting. The black plastic push/pull lever that operates the safety cover for the razor blade is easy to push and pull using the thumb. There are raised narrow plastic grooves near the razor head, offering a place for the fingers to rest while using the rotary cutter. To operate the cutter, first grasp the yellow handle. Using your thumb, pull back the black plastic lever to uncover the round razor blade. Make sure the hand is firmly on the handle. The index finger rests on the raised plastic notches near the razor blade– be careful where you place your fingers. Set the rotary cutter blade against the fabric and push the cutter forward with firm, even pressure. The fabric slices as the rotary cutter rolls its way across the material.Just as if you were using a pair of scissors, make sure the rotary cutter blade is straight up and down. If the cutting blade is angled, the fabric will cut at an angle. 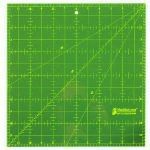 This would be more noticeable when cutting layers of fabric than a single piece of material. 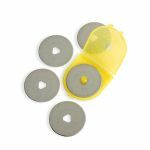 While the smaller 28mm rotary cutter can easily cut through four layers of 100% cotton, this larger 45mm rotary cutter can handle eight layers of that fabric. Accommodates both left and right handed users. 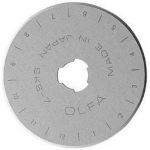 One really nice feature of the Olfa 45mm rotary cutter is that Olfa provides different types of blades (purchased separately) to use in the cutter. The traditional smooth round blade for standard cutting. The pinking blade that acts as a pair of pinking shears. 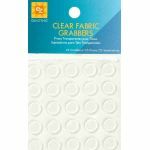 Use it to reduce raveling of fabric edges or for a decorative edge finish. The scalloped blade is actually two blades in one. Set the blade one way in the rotary cutter for a scalloped edge. Remove the blade and turn it around, replacing it in the cutter, and you have a blade that produces a peaked edge. The wave blade produces a wavy edge that is nice for finishing off polar fleece or other fabrics that don’t fray. The decorative blades can also be used to cut fancy edges on paper. I don’t use the 45mm cutter for cutting paper. If you decide to cut paper with any of the blades, note that paper may dull your blades faster than fabric.